Logix Engineering are able to supply double skin thermally insulated and air-conditioned outdoor aluminium 19” and 2I” data and communications enclosures. The ITDS-AC range expands our extremely successful ITCS Enclosure range in locations where sensitive electronic components are not field hardened. Logix Engineering Pty Ltd are the Australian distributor of Envicool Technology Co Ltd range or air-conditioners and air to air heat exchangers. The ITDS-AC range of enclosures are specifically designed to accommodate this equipment. 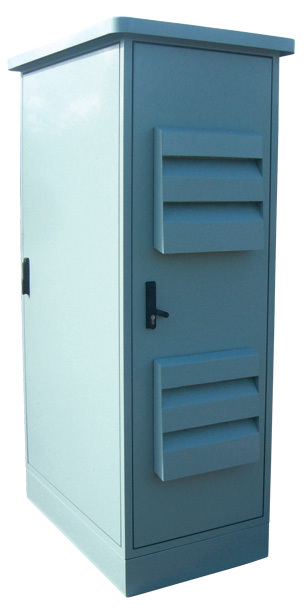 The ITDS-AC range is manufactured from structural grade aluminium extrusions and marine grade aluminium sheetand is powdercoated T33 smoke blue. Third party accreditation has been undertaken at the NATA registered Queensland Government SIMTARS test station, tests include, IP56, Temperature Rise, Lifting and Mechanical load tests, all undertaken to the relevant Australian and IEC Standards. Click image to view gallery (2).